Cook zucchini JUST UNTIL TENDER. Drain. Cook carrots and onions in a LITTLE water for about 5 minutes. Drain. Melt butter in saucepan and add carrots and onions. 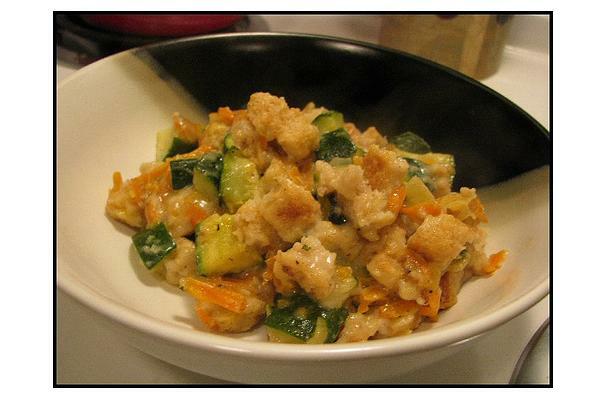 Stir in chicken soup and sour cream and mix in zucchini carefully. Mix in 1 cup stuffing mix. Pour into 7x10 inch casserole. Sprinkle the 1/2 cup stuffing mix over top and bake at 350 degrees. Bake 30 to 35 minutes uncovered. Use stuffing mix dry as is.